Four queens on the board! One rarely sees this in games between experienced players, especially with so much other material still left on the board. 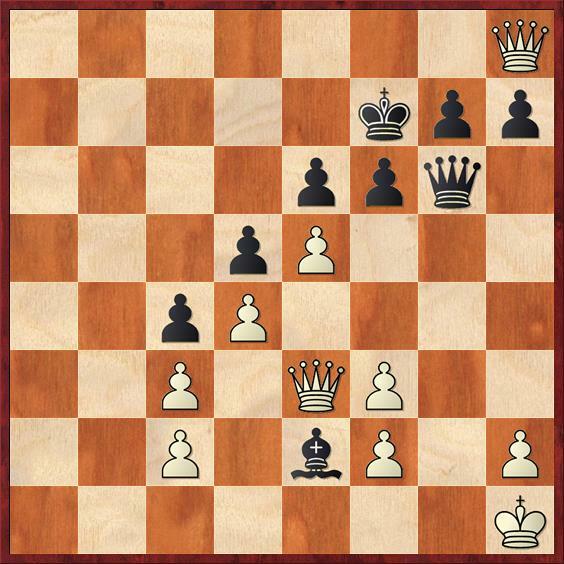 Unfortunately, four-queen positions rarely last for long, and I thought that would surely be the case here. I was just waiting for 1. … Rf2+ 2. Kc3 Rxc2+ 3. Kxc2, and now we’re down to a three-queen position that is hugely in Black’s favor. 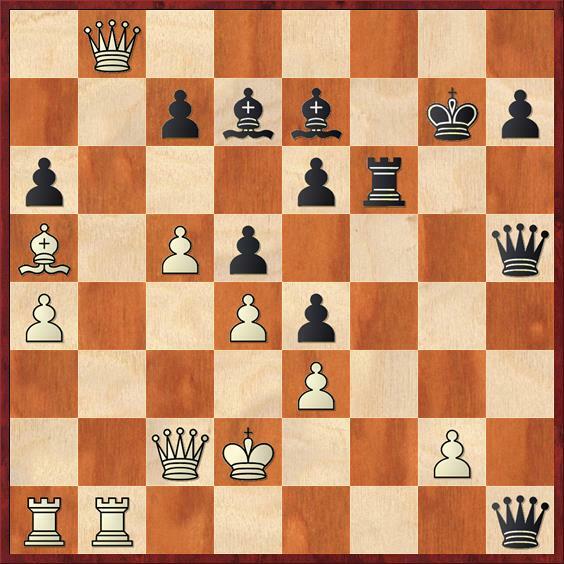 This would work, except that Black has forgotten one little thing: White’s bishop on a5. After 2. Kxe2 Qxg2+ 3. Kd1 Rf1+ 4. Be1! saves White. After 4. … Rxe1+ 5. Kxe1 Qxc2 Black wins the queen back but is down too much material. White played 6. Qb2 Bh4+ 7. Kf1 Qd3+ 8. 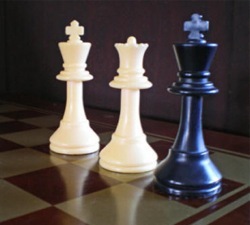 Qe2 and Black resigned. So this brings up an interesting question: Have any of my readers ever had a serious game that went to four queens? I don’t think I ever have. However, back when I was a class-A player I had a game that was perhaps even more unusual: a game that I won in spite of having one queen against my opponent’s two. Here is how it happened. Position after 24. … Kd7. White to move. Up until this point, White had played brilliantly, sacrificing a bunch of material to queen his a-pawn and expose my king. He is completely winning, but he does have to be just a little bit careful. 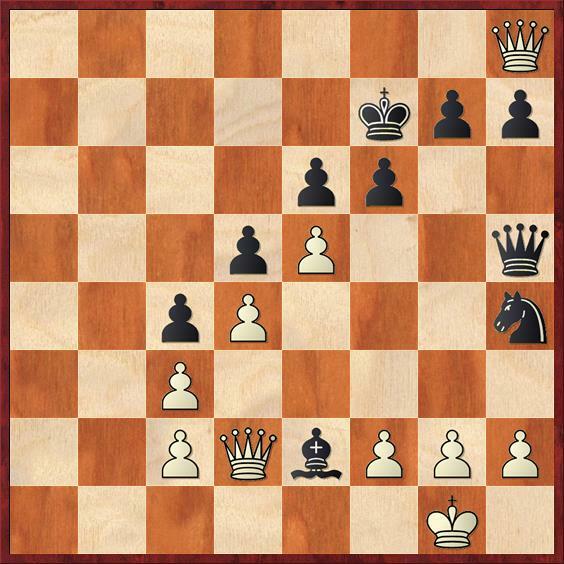 I have a number of pieces, as they say, “loitering with intent” around the kingside, and he needs to be careful not to let me get counterplay. He wasn’t careful. Not a mistake, but it does leave the back rank unguarded. It would be more circumspect to keep the rook at home, perhaps with 25. Qa7+ Ke8 26. ef gf 27. Qf4. Now the two queens are well organized, and Rb8 is a decisive threat. It seems weird to talk about piece coordination in a position where White has two queens, but in the game it is precisely the lack of communication between the queens that is his problem. Now it’s getting really dangerous for him, because of the back rank. However, a little cleverness should still suffice. If White plays 27. Qc1! the queen stops the back-rank threats and also threatens to come to a3 with a timely check. But again, White plays as if oblivious to any danger. He forgets one of Mike Splane’s rules: when you have a winning advantage, first keep your opponent from getting counterplay. 27. Rb8+? Rxb8 28. Qxb8+ Kf7 29. Qxh8 Nh4! Position after 29. … Nh4. White to move. White is still winning, but it takes a problem-like move to do it. Can you see how? First I think you need to see what is wrong with all of the natural moves. If 30. Kh1? Nf3! wins. If 30. h3? Qg6! wins. If 30. Qf4?, Ng6! forks the two queens. If 30. ef?, trying to prepare Qf4, 30. … Nf3+! 31. gf Qg6+ again wins. The only solution that I’ve been able to find for White is 30. f3!! The idea behind this move is simply to give White’s king a little bit of luft. Now 30. … Nxf3+ 31. gf Qxf3 32. Qe1 falls just a little bit short for Black. And if 30. … Bxf3 now 31. ef! works because there is no Nf3+ any more! After 31. … gf 32. Qf4 wins because White is ready to answer 32. … Ng6 with 33. Q4xf6 mate. Cool stuff! Fortunately for me, my opponent didn’t see all these subtleties, and instead he played 30. Qe3? This lost to 30. … Nf3+! 31. gf Qg6+ 32. Kh1 and now I’ll bet you can find the winning move for Black. Position after 32. Kh1. Black to move. 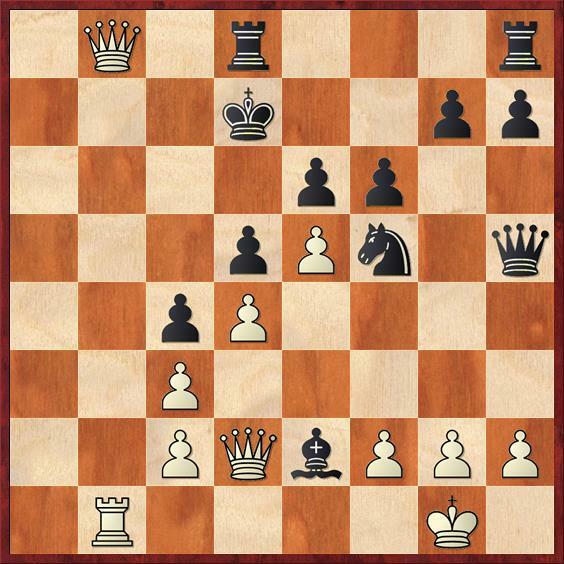 Here White may even have thought that he was still okay, because he has prevented … Bxf3 checkmate. But if so, he forgot that the bishop can also sneak around the back way! After 32. … Bf1! White has no way to stop checkmate. He played 33. Qxg7+ Qxg7 and then resigned. This is one of those games that teaches you never to give up. It sure looked bad for me when I was fighting those two queens, but his queen on h8 ended up being just a bystander. As Craig Mar is fond of saying, it isn’t just the total material that is relevant but also the amount of material in the crucial sector of the board. On the kingside, where it really mattered, I was effectively two pieces ahead, and that was enough to win. P.S. You might recognize the pawn formation in this game as a Winawer French. After this near-death experience I decided I didn’t know what the heck I was doing in the French Defense, and I never played it again in a tournament game. Previous post: Introducing Daisy Sue! Next post: Matrimony Strikes Again!